The South-East Scotland Roundhouse Characterisation (SESRC) project assessed the excavated prehistoric and early medieval house record of the Borders and Mid/East Lothian. The methodology followed the successful lead established for the North-East Roundhouse Research Project (NERRP), which has also been part-funded by the Society of Antiquaries of Scotland. 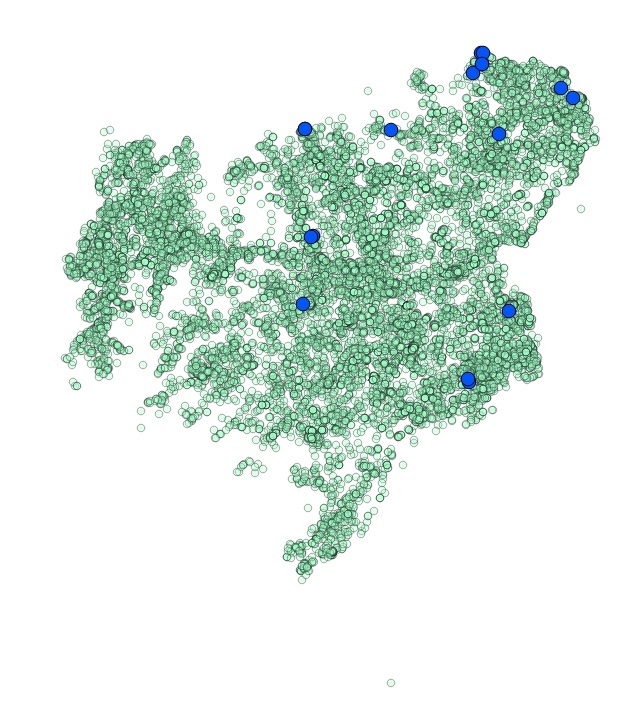 The current phase 1 scoping exercise collated data into a single, geo-referenced database. Because the Society’s grant was awarded to applicant Dr Christopher Bowles of Scottish Borders Council, the assessment concentrated on the Scottish Borders region. The database download from Scottish Borders Council (7 April 2014) was complemented by a DES search (1985-2013) and a review of the Society’s PSAS archive was made available; the Mid and East Lothian records were assessed via their online SMR. The SESRC assessment analysed 15,741 HER data points and 223 HER event polygon entries of archaeological investigations, primarily data of the last 5-6 years. The latter yielded 12 possible sites, but none with definite roundhouse evidence (Fig 1). 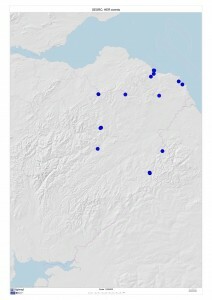 The HER points data relating to excavated sites (total 374) contained 14 prehistoric sites, 54 Iron Age sites, 60 Bronze Age sites, 3 Neolithic and 2 Mesolithic sites. Of these 5 were domestic settlement/house sites of general prehistoric date, 27 settlements of Iron Age date, 2 Bronze Age and 1 Neolithic, which is the important site of Meldon Bridge with its characteristic pottery style, where one domestic structure was identified. No Mesolithic settlement site has been recorded in the Borders HER, although Gravald Burn (DES 1998, 80; DES 2000, 77) records a shelter of Late Mesolithic date. 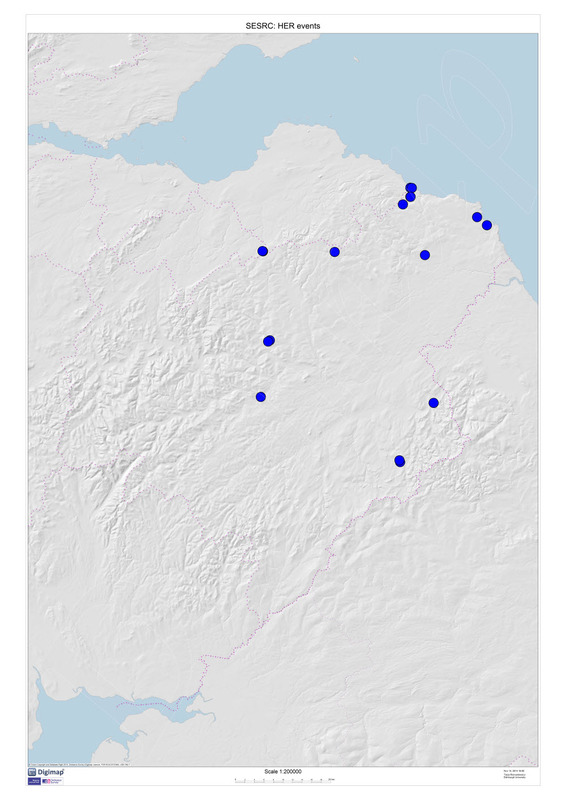 108 early medieval sites have been excavated, but this dataset will require further detailed analysis in order to isolate possible roundhouse data. A further three sites were identified in the DES assessment. The assessment demonstrated that recent developer-funded work consisted of small-scale private housing and large-scale windfarm and afforestation projects. While the former typically yielded no significant prehistoric remains, results from windfarms and afforestations did also not contribute substantially to the upland settlement record. Although Tamshiel Rig afforestation and Fallago Rig windfarm have produced coherent settlement evidence, a general lack of upland excavations suggests that either mitigation is very efficient in identifying and avoiding prehistoric archaeological remains during the groundbreaking works, or that watching brief conditions, in particular at windfarms, are not ideal to identify unknown and hence subtle upland archaeology. Where prehistoric evidence has been identified in commercial work, i.e. during various phases of monitoring at Kinegar Quarry or at Cadrona Mains, the evidence of pits and postholes is not immediately suggestive of roundhouse settlements and will require further in-depth analysis to clarify the results. Commercial work has thus added few new sites to the already known ones, excavated by Jobey, Steer or Dent. This picture is similar in Mid and East Lothian. Besides the commercially identified sites such as Lamb’s Nursery, Newbattle; Longyester Quarry or Barbachlaw at Wallyford, the picture remains dominated by Broxmouth; Dryburn Bridge; St Germains; or Fishers Road, Port Seton. General trends in the Scottish Borders record identified a bias of excavations in favour of Romano-British / Late Iron Age farms (scooped settlements) as part of the Newsteads Environs project and of Bronze Age unenclosed platform settlements as part of the Biggar Archaeology Group work (and recently Glenrath Hope of the Hidden History project). The Tweed valley seems surprisingly empty of developer-funded sites (Fig 2). Where recent work is missing is on sites that sit chronologically in-between, probably represented in the uplands by enclosed settlements (palisaded enclosures, forts) or by the lowland cropmark evidence. As a result from SESRC it has become clear that a regional research framework is urgently needed to particularly ensure that the sites and monuments that are so far underrepresented within developer-funded and research/community work are better understood in order to identify them in their typical locations and to guide and control development impact and volunteer-based works. Isolated pits and postholes may hold the key to these missing sites, but would require more detailed post-excavation work. Methodology of archaeological monitoring works for windfarm or afforestation projects might also require reviewing. Identifying the potential and limitations of, and the threats to the archaeological resource helps underlining the necessity for a regional research agenda and to unlock funding for such an exercise. Support by the Society has demonstrated recognition of the importance of the South-East Scottish record, and will help facilitate the implementation of the ScARF objectives at regional level.